We shout goal, the ad boards scream HTC One! UPDATE: Check out our Hands on: HTC One review. 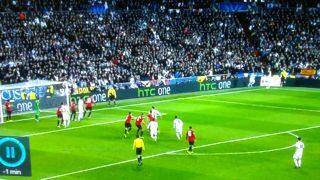 The HTC One name has hit the big stage after it popped up on advertising boards during the Real Madrid vs Manchester United football match. Hype surrounding the Taiwanese firm's next flagship handset is building and the originally touted M7 name looks set to be usurped by the simpler HTC One handle, but that's not the reason behind the ad in question. During the first half of the match we noticed the branding appear on the boards surrounding the pitch and it made us wonder if this was the beginning of what we'd expect to be a worldwide marketing campaign for the upcoming device. However having spoken to HTC, TechRadar can confirm that this particular advert is not connected to the firm's next flagship handset and is instead referring to the umbrella brand which covers the likes of the One X, One S and One V.
The timing of this particular campaign is interesting though, considering the firm has an event lined up on February 19 where it will unveil its next flagship smartphone. Until then we're going to enjoy the second half and for those of you who are not one of the 200 million fans watching the game there's always a countdown timer to ogle.